Like Alan Class comics, comics produced by the Atlas Publishing and Distributing Company (no relation to Marvel/Timely/Atlas, or even the short-lived mid 1970s Atlas/Seaboard who both operated on the other side of the atlantic ocean) were sure to NOT date their range to maximise the chance for the newsagents to sell their monthly sixpenny black and white comics. I think the Annuals sold quite well however. The most popular ones were Superman, Superboy, Superadventure, (and later Batman) which were usually released around August/September time and bore two dates such as 1957/1958. The Lone Star Annuals (of which there were at least six..possibly ten) published between 1953 and 1963 seem to have dispensed with a date on the cover. They were numbered (usually inside) instead. As I only own two Lone Star Annuals I can merely assume the others in the series would have had similar contents. These two mostly contain the expected Lone Star rider western strips but are livened up by the inclusion of some cartoons along with Captain Cutlass and Space Ace. Miller comics produced dozens of cowboy comics, usually re-printing stuff from the states. Atlas too had their share of western reprint comics. However Atlas’ Lone Star contained all-British material. Atlas took over in 1956 and the comic lasted until issue number 99 in 1963. Lone Star magazine had originally begun in 1953 as a tie-in promotional tool for Die Cast Machine Tools Ltd range of toys. Toy handguns with holsters and toy rifles were massively popular with children of the 1950s brought up on a diet of Cowboy TV shows. Usually they were “capguns” that made a “loud” bang when paper gunpowder capsules were inserted. These days toy weapons of any type are frowned on, although I see that there are still replicas around. Today, cap guns and other toy guns in the United States must be manufactured with a bright orange, red, or yellow tip placed over the “muzzle” of the cap gun, or with the entire gun made in these or other bright colours. Laws requiring these markings were made because of incidents where civilians – usually children or teenagers – were killed by police officers when the officers thought they saw real guns. While these incidents were rare, lawmakers decided that toy guns must be marked so they cannot be mistaken for real guns.It is also possible to commit acts of robbery with a replica gun, since no shots need to be fired from a gun that looks real. There are many collectors throughout the world who collect all types of cap guns, even though restrictive laws in some areas may make it difficult. Whereas the toy guns brought small prices originally, they now command significant prices for many models, with some of the most famous sets of holsters, guns and original boxes selling for high prices at auctions and toy gun shows. Some collectors will collect all types of cap guns, but many collectors specialize in either guns named after a famous western hero or a particular company’s set, like the Nichols Industries or Hubley cap guns. PS: Die Cast Machine Tools didn’t just make toy guns. They produced a range of toy cars similar (though not quite as good quality) to the Dinky/Corgi models. Although they are now 38 years old it still seems to be quite easy to get the 1975-version Atlas Comics for not too much money. 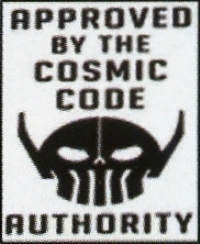 Galactus knows why, but on an impulse I’ve just acquired a stack of them from eBay. And I’ve still got loads that I foolishly bought when they were new!! Despite supposedly having given up “collecting” years ago, and as I’m so near to a full set, against my better judgement I feel an overwhelming urge to locate the missing issues now that I have virtually the complete checklist right here. I’m only missing the (difficult to find in the UK ) one-shot Gothic Romances and two Monster Mags. Marvel Comics had called themselves Atlas for a period in the late 1950s. The UK also had an Atlas Publications producing comics and annuals at the same time. Most likely due to editorial disarray and a belief that as long as it looked like a Marvel comic it would sell in truckloads Seaboard/Atlas only survived for 6 months in 1975. By the time the returns began flooding in, it must have been obvious that the comics weren’t selling. In 2011 three of the Seaboard Atlas characters re-appeared with updated versions of The Grim Ghost, Phoenix and Wulf the Barbarian. I dunno if they’re still being published now though. And I don’t think they’re likely to resurrect Vicki……. Out of the 70 original 1975 comics and magazines spanning 28 titles there were 4 issues of Vicki. The other comics may have been of variable quality but at least they were new, if a trifle derivative of contemporary Marvel material. Vicki comics were derivative of Archie comics and also reprints. The covers may have been new but the stories in the 4 issues had originally appeared in the 1960s in Tower’s Tippy Teen comics. Some of the Tippy/Vicki artwork was slightly re-drawn to make the clothes a little less dated, but they still looked like Archie comics from a decade earlier. The “Golden Age” UK/Australian Atlas/K.G.Murray Superman No 29 published in August 1952 reprinted the cover story from Superman 73 dated Nov/Dec 1951. No sideways comics this time. I like this exchange between Lois and Superman from the backup story “The Anti-Superman Club” (originally found in Superman 71). The “Golden Age” UK/Australian Atlas/K.G.Murray Superman No 24 published in March 1952 reprinted the cover story from Action Comics 155 from a year earlier. The rest of the comic was made up of DC material from other places such as the Johnny Quick story that was originally found in Adventure 150. Apart from the missing gun on the cover the oddest thing about this comic, (and presumably other comics issued by Kenneth G.Murray at the time) was that half of the comic consisted of two DC pages reduced and printed sideways. Not something you see every day. Gosh, he certainly does look red on the cover. The muddy black and white interior artwork isn’t that marvelous either but I’ve scanned it anyway. It was difficult to read in the comic also, with the last story looking particularly washed out as if they were running out of ink in the printing press. I suffer for my art. Now it’s your turn. I never liked Judge Dredd (or 2000AD for that matter). That comic began during a period when I had little interest in comics and was perhaps buying just a couple of Warrens each month. I wouldn’t return to purchasing UK comics on a regular basis until the 1980s and Warrior. I’d buy an issue of 2000AD perhaps once a year just out of curiosity. At the risk of enraging Tharg and his supporters, I don’t see that Mr Dredd has any personality to engage the reader. I wouldn’t care if he got blown up or not. I’m sure that was the idea. He’s just a cypher. Like in the Astro City comics that came much later it is the characters both good and bad inhabiting the Megacity that drive the plots. A couple of years ago I purchased a random issue of 2000AD which contained what I consider to be one of the better Judge Dredd stories. So to contrast and compare here is a UK SF comic strip from almost 50 years after the Red Comet. If nothing else it shows how the printing processes have improved immeasurably. Splundig Vur Thrigg. PS: These comics below appeared in a forum earlier this year as jpg images. I decided to convert them into cbz files for my own convenience. As you seldom see copies of Miller and Atlas comics these days, let alone scans of them I thought they were worth putting back out to the Interweb again……. PPS: The Marvelman comic is from 1959. 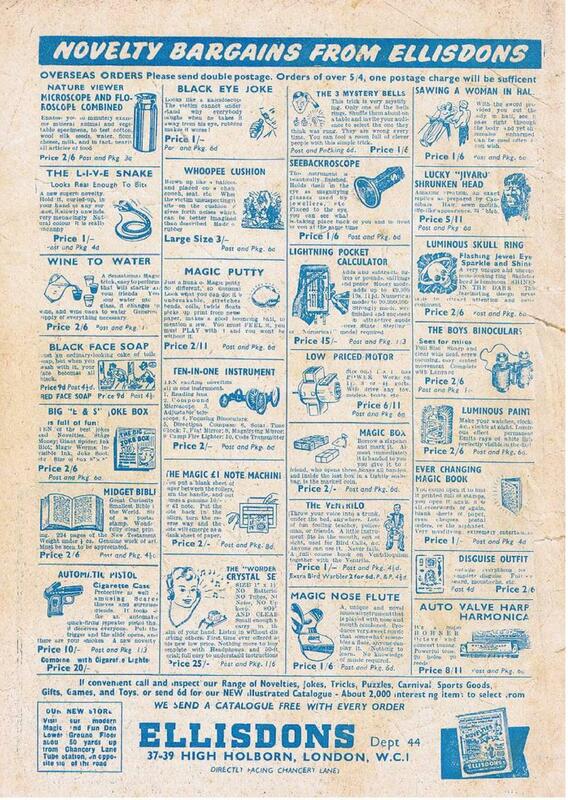 The back cover has this advert for the Magic Tricks/Novelties Mail Order Company (and shop) Ellisdons. They were still going strong in the 1960s when I would send off for a variety of fab gear/tat that usually required a Postal Order of around 1/6d not forgetting the 6d post and packing. Do you remember the strange “throw your voice” device you had to hold in your mouth and be careful not to swallow !! Or the wonderfully named “Seebackroscope” ?? The first of the four Atlas “Space” Annuals was the most comicy (is that even a word?) of the lot. Plenty of Space Ace stories and even a smattering (is that a word either?) of half page humour strips along with the photos and articles. Luckily it is only 64 pages short, and a small amount of bribery has resulted in acceptable scans of all pages. Just scroll down and click on the link. Simples. Before my thoughts wander back to more sensible subjects (?!?) like crap 1970s pop music or offshore radio there is one more series by the Atlas Publishing and Distributing Company Ltd (to give them their full title) from the 1960s that at least deserves a mention. In 1963, 1964, 1965 and 1966 Atlas published a book presumably for teenagers and presumably on sale in time for Xmas (sorry I’m supposed to say “Christmas”) titled “The Book of Space Adventures” and subtitled “The latest developments in the world space programmes” which was quite a lofty claim !! The 1963 edition must have been published in late 1962. It contained a number of factual articles and photographs of rockets and jet planes along with “Space Ace” adventure strips. The 1964 and 1965 editions followed a similar format only with “Ace Jordan” strips. Actually, thinking about it, these were probably Space Ace stories too. I don’t own a copy of the final 1966 book but I have found a picture of the striking and quite modern-looking cover. As was usual for the times half the strips were in duo-colour (an odd yellow/blue in the case of the 1965 No 3 Annual) and the other half were “fully coloured”. Now their idea of colour and mine doesn’t quite correspond. They could well have been coloured by an infant class in school at break time using a combination of spit and blunt crayons such is the strange finished results !! This page is perhaps the best of the bunch. The rest have “scribble” backgrounds.